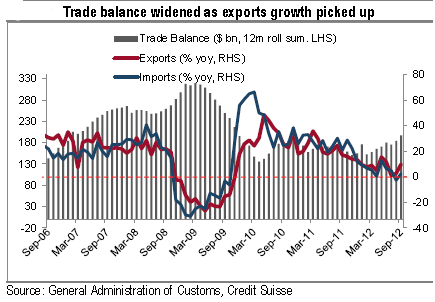 China's trade surplus increased in September - the first positive surprise in months. It seems those new iPhones as well as Christmas-related products were responsible for the increase. Credit Suisse: - Wireless handset and components saw an acceleration in its growth pace to 20.2% YoY, up from 8.4% in August. We think this can be attributed to the release of a new generation of smartphones and suspect the momentum may sustain through the coming few months as distributors worldwide stock up. The growth of Christmas-related items, such as toys, clothing and shoes, all picked up on a YoY basis. The fact that there could be over-capacity in the manufacturing lines for clothing and toys could have allowed the exporters to make rush shipments.